PREVENTION IS OUR BEST DEFENSE FOR CANCER. THIS INCLUDES SUN AVOIDANCE AND AT LEAST ANNUAL FULL SKIN EXAMS WITH YOUR DERMATOLOGIST. 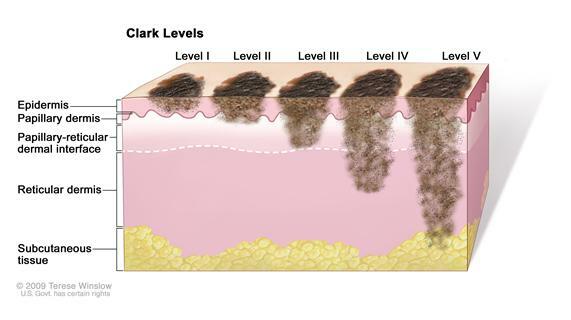 Large size Most melanomas are at least 5 millimeters (about 1/4 inch) across when they are found; many are much larger. An unusually large mole may be melanoma. Many colors A mixture of tan, brown, white, pink, red, gray, blue, and especially blackin a mole suggests melanoma. Irregular border If a mole has an edge that is irregular or notched, it may be melanoma. Abnormal surface If a mole is scaly, flaky, oozing, or bleeding, has an open sore that does not heal, or has a hard lump in it, it may be melanoma. Unusual sensation If a mole itches or is painful or tender, melanoma may be present. Abnormal skin around mole If color from the mole spreads into the skin around it or if this skin becomes red or loses its color (becomes white or gray), melanoma may be present. Note: Separate PDQ summaries on Skin Cancer Prevention, Skin Cancer Treatment, and Levels of Evidence for Cancer Screening and Prevention Studies are also available. The only widely proposed screening procedure for melanomatous skin cancer is visual examination of the skin, including both self examination and clinical examination. In asymptomatic populations, the effect of visual skin examination on mortality from nonmelanomatous skin cancers is unknown. Further, the evidence is inadequate to determine whether visual examination of the skin in asymptomatic individuals would lead to a reduction in mortality from melanomatous skin cancer. Study Design: Evidence obtained from a single case-control study. Magnitude of Effects on Health Outcomes: N/A. Based on fair though unquantified evidence, visual examination of the skin in asymptomatic individuals may lead to unavoidable increases in harmful consequences. These include complications of diagnostic or treatment interventions (including extensive surgery) and the psychological effects of being labeled with a potentially fatal disease. Another harmful consequence is overdiagnosis leading to the detection of biologically benign disease that would otherwise go undetected. Study Design: Opinions of respected authorities based on clinical experience, descriptive studies, or reports of expert committees. Consistency: Multiple studies; small number of participants—no consistency. Magnitude of Effects on Health Outcomes: Unknown. Skin cancer is the most common cancer in the United States, affecting more than 1,000,000 Americans every year. It accounts for more than 10,000 deaths annually. Skin cancers are easily detected clinically and are often cured by excisional biopsy alone. This does not mean that they are unimportant or can be neglected without adverse consequences. When neglected, they can be disfiguring and/or cause death. There are three major types of skin cancer: basal cell carcinoma, squamous cell carcinoma, and cutaneous melanoma. Basal cell carcinoma has the highest incidence and melanoma has the lowest. Basal and squamous cell carcinomas have an excellent prognosis, but persons diagnosed with these nonmelanomatous skin cancers are at higher risk for developing additional skin cancers. Melanoma, which is the focus of this summary, accounts for approximately three-fourths of all skin cancer deaths. Mortality from melanoma increased after the 1970s, especially in white males. [3,4] In the 1990s, melanoma mortality rates stabilized. In 2010, it is estimated that 68,130 individuals are expected to develop melanoma, and about 8,700 are expected to die of this disease. In the United States, observed incidence increased 126% between 1973 and 1995, at a rate of approximately 6% per year, though incidence rates appear also to have stabilized in the 1990s. A study of skin biopsy rates in relation to melanoma incidence rates obtained from the Surveillance, Epidemiology, and End Results Program of the National Cancer Institute indicated that much of the observed increase in incidence between 1986 and 2001 was confined to local disease and was most likely caused by overdiagnosis as a result of increased skin biopsy rates during this period. The incidence of melanoma rises rapidly in Caucasians after age 20 years. Fair-skinned individuals exposed to the sun are at higher risk. The best defense against skin cancer is protection from the sun and ultraviolet light, though the effectiveness of sunscreens in preventing melanoma has been challenged. (Refer to the PDQ summary on Prevention of Skin Cancer for more information.) Individuals with certain types of pigmented lesions (dysplastic or atypical nevi), with several large nondysplastic nevi, with many small nevi, or with moderate freckling have a twofold to threefold increased risk of developing melanoma. Individuals with familial dysplastic nevus syndrome or with several dysplastic or atypical nevi are at high (>fivefold) risk of developing melanoma. American Cancer Society. : Cancer Facts and Figures 2010. Atlanta, Ga: American Cancer Society, 2010. Also available online. Last accessed October 13, 2010. Ries LA, Kosary CL, Hankey BF, et al., eds. : SEER Cancer Statistics Review 1973-1995. Bethesda, Md: National Cancer Institute, 1998. Also available online. Last accessed July 12, 2010. The melanoma mortality rate in the United States increased by 1.7% annually between 1973 and 1990, then decreased or stabilized thereafter. The changes in this trend in the 1990s might be due to prevention and/or early detection practices. More than 90% of melanomas that arise in the skin can be recognized with the naked eye. Very often, there is a prolonged horizontal growth phase during which time the tumor expands centrifugally beneath the epidermis but does not invade the underlying dermis. This horizontal growth phase may provide lead time for early detection. Melanoma is more easily cured if treated before the onset of the vertical growth phase with its metastatic potential. The probability of tumor recurrence within 10 years after curative resection is less than 10% with tumors less than 1.4 mm in thickness. For patients with tumors less than 0.76 mm in thickness, the likelihood of recurrence is less than 1% in 10 years. Various observational studies exploring the possibility that melanoma screening may be effective have been reported. An educational campaign in western Scotland, promoting awareness of the signs of suspicious skin lesions and encouraging early self-referral, showed a decrease in mortality rates associated with the campaign. No randomized controlled trials have been performed, however, to assess screening efficacy, though one randomized study is under way in Australia. A case-control study of 650 cases (and 549 controls) diagnosed in Connecticut showed that skin self-examination was associated with reduced melanoma incidence. The authors estimated that monthly skin self-examination might decrease disease-specific mortality by 63%, but the observed incidence effects may have been the result of study biases, which frequently affect case-control study designs. Differentiating between benign and malignant melanocytic tumors during histologic examination of biopsy specimens has been shown to be unreliable even in the hands of experienced dermatopathologists. This fact undermines results of studies examining screening effectiveness and also may undermine the effectiveness of any screening intervention. Furthermore, this suggests that requesting a second opinion regarding the pathology of biopsy specimens may be important. Ries LAG, Eisner MP, Kosary CL, et al., eds. : SEER Cancer Statistics Review, 1975-2002. Bethesda, Md: National Cancer Institute, 2005. Also available online. Last accessed July 12, 2010.